COLUMBUS — Ohio State’s 74-70 win over Penn State (8-15, 1-11) wasn’t pretty and didn’t even have all that great of a personality. The Buckeyes (15-7, 5-6) went on runs and had runs run on them for a somehow disjointed, yet up-and-down affair that finally gave way to a merciful clock despite the officials’ best efforts to take this game well into the night. 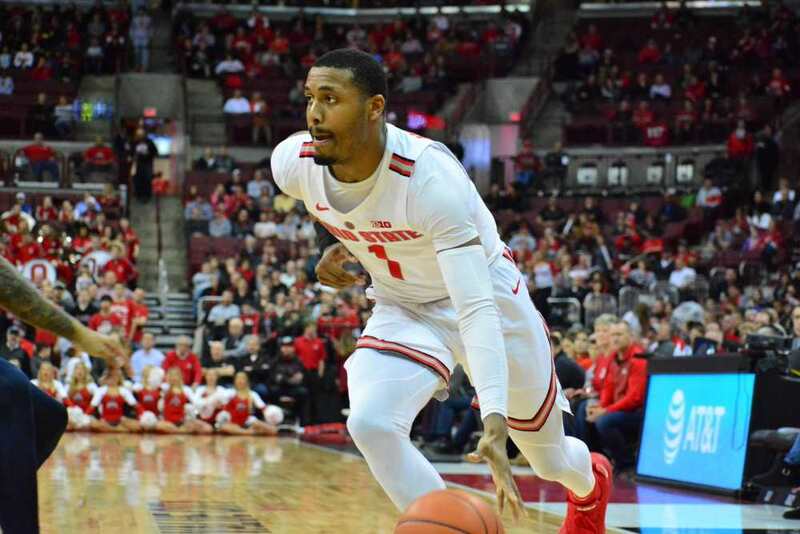 Ohio State was led in scoring by freshman guard Luther Muhammad with 20 points. He was joined in double figures by senior point guard CJ Jackson with 15 points and junior wing Andre Wesson with 15 points as well. The Buckeyes shot 50% from the field, including 7-of-14 from three-point territory, but rarely did they have an answer for Penn State’s three-quarter-court pressure. Ohio State turned the ball over 18 times — including 12 times in the first half, with most of those coming via very bad passes against the trap. Three times last season Penn State defeated the Buckeyes, and they almost made it four in a row even though OSU once had a 15-point lead in this game. The Nittany Lions opened with a 7-2 lead before the Buckeyes finally began to have some success against the trap. Ohio State went on a 22-1 run that was capped by a three-pointer from Kaleb Wesson. Wesson was kept quiet for much of the game because Penn State would constantly double-team and trap him whenever the ball went his way. He also dealt with some foul trouble throughout the game. He finished with six points in 19 minutes of play before fouling out in the second half. The Buckeyes held a 28-13 lead with 5:17 to play in the first half, but Penn State closed on an 18-6 run to cut OSU’s lead to just 34-31 at the half. Consecutive jumpers by Muhammad, including a three, followed by a basket from senior point guard Keyshawn Woods made it 46-37 Buckeyes with 16:27 to play. That run was once again answered by the Nittany Lions, as PSU went on a 12-0 run to take their first lead since the first half. Now trailing by three, the Buckeyes were desperate for a basket, which freshman guard Duane Washington was able to provide. He dropped in a three-pointer to tie the game, and then hit another jumper and added a free throw to give the Buckeyes a 54-51 lead with 9:54 to play. With OSU leading 66-61 with 3:17 to play, Penn State’s John Harrar was whistled for a flagrant foul as he pancaked Kaleb Wesson to the ground while attempting to box out on a shot attempt. Wesson made both free throws and appeared to give the Buckeyes some breathing room. Leading 69-68, Andre Wesson threw a bad pass against the trap that was intercepted and turned into another Reaves dunk, giving Penn State the lead with just 1:34 remaining. Sophomore forward Kyle Young, playing for the first time in several games following a stress fracture in his leg, converted a layup, but missed the subsequent free throw attempt. 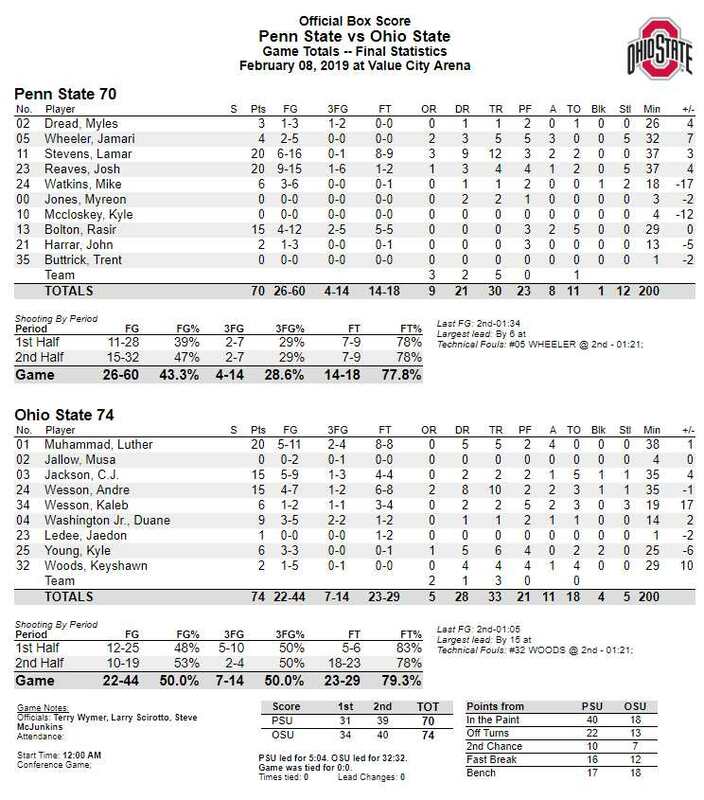 Young then got the shot block on Penn State’s next field goal attempt, which then allowed Ohio State to close the game out on free throws and secure the 74-70 win. Freshman guard Luther Muhammad gave some pretty good glimpses at what his future is going to look like. Several times he left his man slipping and sliding (partly due to a damp court on the evening) following a crossover dribble. He was 5-of-11 from the field and 2-of-4 from three. More importantly, he hit all eight of his free throw attempts and again played tremendous defense. He also grabbed five rebounds, led the team with four assists, and didn’t commit a single turnover in 38 minutes of action. + Freshman guard Duane Washington provided a needed offensive spark several times in this game. He has not shot the ball well since about game five this season, but he never lacks for confidence in his shot. It was good to see him put the ball in the basket tonight as he scored nine very necessary points in 14 minutes of play. He hit both of his three-point attempts as well. + Sophomore guard Musa Jallow got the start but played just four minutes. He took two shots, missing both. Senior guard Keyshawn Woods played 29 minutes off of the bench, scoring two points on 1-of-5 shooting. He finished with one assists, four fouls, and four turnovers. + Sophomore forward Kyle Young was also a very necessary spark for the Buckeyes on both ends of the court. He made all three of his field goal attempts, grabbed six rebounds, and blocked two shots. The energy he provided — and the ability to keep some size on the court when Kaleb Wesson was out — was invaluable. + Andre Wesson had a team-high 10 rebounds. His younger, bigger brother had just two, but finished with a team-high +/- of +17 in just 19 minutes of action. That should give you some idea of his value when he is on the court.